Lots has been going on, so stick with me for all the Hot News. We’ve got some great offers to tell you about that you don’t want to miss. When Flamingos Attack is the first official adventure for Claustrophobia!, and the perfect introduction to the game. It’s more than that though, as it sets the scene for a larger campaign I’m designing. January was an excellent month for Claustrophobia!, and so putting aside time to support the game was a natural next step. That’s the thing about this industry; fan support is vital to the growth of any game, so I deeply thank you for getting behind us on this. We’re just putting the finishing touches on a new Pathfinder Roleplaying Game compatible adventure too. Contagion’s Kiss is a location based adventure, with the PCs needing to break into a defended keep to solve the mystery of the poisoning of the town’s wells. We have some fun surprises hidden within! Contagion’s Kiss will be available by the end of the month. We previously released our 2016 PDF bundle, and this month we’ve release a Pre-2016 bundle, which includes the updated Lunatic Labyrinth solo and 1-on-1 adventure. We’re not the only ones with a great bundle out. Legendary Games has a massive sale on Pathfinder Roleplaying Game compatible books: 60 books for $30. You can grab yours on DriveThruRPG. The last bit of news is that we’ve signed the compatibility license for the Starfinder Roleplaying Game, since it will lend itself nicely to something we’ve been chipping away at. That’s it for this month. Remember, you can get all the news, every month, by subscribing to our newsletter. 2017 is going to ROCK! Quick, wish them a Happy New Year so we can talk about the wands! Um, yes, Happy New Year. May 2017 be a truly prosperous year for you and yours. Rising Phoenix has a big year planned, with all sorts of projects in the works. 2016 was a smash hit for us, and 2017 promises to be even bigger. Imperiad Publishing announced that the Nightscape series of Lovecraftian horror will be getting its very own roleplaying game this year. Although Rising Phoenix Games isn’t the publisher, our head bird, Rodney Sloan, is designing the game, so we’re super excited for their offering, which comes out in September. Here’s the trailer to the Nightscape movie. WARNING: The following trailer is unrated and may be disturbing to sensitive viewers. Rodney is also the new line developer for Steampunk Musha, an Asian inspired steampunk setting, developed by Fat Goblin Games. If you love Asian inspired worlds, consider yourself an otaku, are a Steampunk connoisseur, or love kung-fu kicking oni in the face, come join the team for a chat on Facebook. As for our own stuff, Claustrophobia! has some exciting things on the go, with its first adventure sitting in layout. 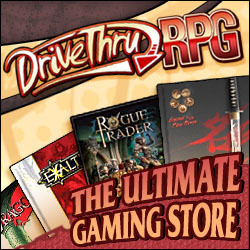 Right now, until the 23rd, the complete rulebook is on sale for 20% off on Drive Thru RPG. This is a great time to pick up a copy and introduce a new game to your group. We’ve also collected all our works from 2016 in one handy, discounted bundle. If you’ve already bought some of our books on One Bookshelf sites, you won’t have to pay for them again, so it’s a great way to grab any Field Guides you might still need. Some of our fans might remember our popular Lunatic Labyrinth, our first product, ever. It has been hugely successful, with over 5000 sales to date. We’ve relaunched it, updating the text and added a map tile for the combat encounters, making it better than ever before. If you like what we’re doing, why not join us, we’ve put out an open call for writers. You can find more information on the blog. If you’re a Pathfinder fan, of if you’d like to to get started with the Pathfinder Roleplaying Game, there are still a few days left to support a good cause and grab the fantastic Humble Bundle they’ve got on offer. Personally, I’ve been enjoying the Goblin comics, fun! And that’s all I can talk about right now, except for those wands I promised you about. Attuned to their owner, personalized wands allow a spell caster to focus their magical powers and channel them with a great deal of accuracy. These rules modify the rule for magic in the Pathfinder Roleplaying Game Core Rulebook and can be used at your GMs discretion. Casting arcane spells with a wand cancels the material component of the spell unless the material component is more than 25 gp. The wand is used to execute any somatic component of the spell too. Personalized wands cost between 500 and 2,500 gp. Casting without a wand is difficult, and even unpredictable. There is a 20% chance of spell failure for any arcane spell cast without a wand. If there is a somatic component to the spell, the chance of spell failure increases to 30%. Casting arcane spells with someone else’s wand, or using a spell storing wand to cast a spell not stored inside it, incurs a 5% chance of spell failure. Till next month, Tell Thrilling Tales! All the pointy red hats, half the price. Claustrophobia! is half off to the next 20 customers only. Get it at Drive Thru RPG. Claustrophobia!, the game of gnomish insanity, is done, and on June 1st it will go live on Drive Thru RPG. I couldn’t be more excited (or nervous). Donovan did some amazing work on the layout, art and design, and you’ll finally get to see that, along with added content about the world of garden gnomes and more. We’ve worked hard to polish the game and I’m sure fans old and new will be really pleased with what they see. You can keep up to date with all things gnome on our Facebook page. We would certainly appreciate a like if we can get it too. Claustrophobia – Book Cover Revealed! In the coming months I’ll be launching the full, beautifully illustrated version of this RPG. Please like and follow the Claustrophobia RPG? page on Facebook and help me make this book launch spectacular. The Amazing Claustrophobia Cover. Illustrated by Donovan Sloan. The Claustrophobia Beta Test is officially over. Thank you to everyone who sent in their feedback, which has been included in the latest version of the Beta Test on DriveThruRPG. Even though the Beta is over, you can always send me your feedback, I’d love to hear from you. The book is off to the graphic designer for illustrations and layout. Watch this space for future updates. I love miniatures, but it was only a few years ago that I gave paper miniatures a try. I’m glad I did. Paper miniatures are inexpensive, easy to carry around, replaceable and look great. That makes them worthwhile if you have to travel and GM. RPGNow: Look around and you’ll find loads of free paper miniatures, as well as some well worth their price. One Monk: has a great collection of figures for fantasy and sci-fi. A good site if you’re looking for armies of miniatures. Okumarts Games: has a fantasy set that looks great, and you can get their starter set free now. Mini Lab Models: Great historic knights and fencers. Wizards of the Coast: have some free terrain you can download too. Here’s a great collection of links to other paper miniature sites, if you have the time to sift through everything. Of course, we can’t forget about Claustrophobia! Here’s a paper gnome from this site. And lastly, just for fun, a little Star Wars diorama.